Actress Naturi Naughton (born May 20, 1984) who is also a singer and formerly being one-third of the R&B trio 3LW showcased gorgeous and glam curls at the recent May 4th LA premiere of “Jumping the Broom” held at the ArchLight Cinemas. 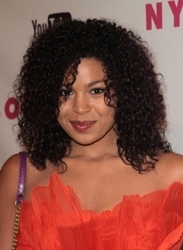 Naugthon who is known for her starring role of Denise in the remake of Fame wears her tresses in an array of hairstyles, but doesn’t always showcase her natural curls like she did for her appearance at the recent LA premiere. After a bitter breakup with 3LW Naughton has been pursuing acting roles as well as working on her own solo debut album which she recently said is not currently an active project. Naughton has expressed a desire to focus totally on acting which she has said is her other passion. In September 2009, Naturi scored her first solo chart entry as her version of “Fame” (from the 2009 movie Fame) entered the UK chart at #74 and rose to #43 in its second week. In its third week, the song jumped ten spots to #33, becoming Naughton’s first solo top 40 UK hit. American Idol Jordin Spraks looks ravishing at the Nylon Magazine Annual Young Hollywood Party held at the Bardo Hollywood in Los Angeles on May 4th. Not only did the beauty show off her sizzling new bikini worthy body, she wore her naturally curly tresses au natural with perfectly formed ringlets. Sparks who posted a photo of herself in a bikini recently told AOL Music that she took the photo because she loved the bathing suit and it turned out so good she after having an internal battle about whether to post it or not, the singer did and the world could see that she’s lost approximately 30 pounds. She looks smokin. It’s always nice to see her wear her hair with her natural curls since sometimes she straightens her stunning coils. There must be something in the celebrity water supply. As reported by People Magazine, actress Katherine Heigl has followed the recent lead of Kate Winslet and Ashlee Simpson and had all of her hair cut off and bleached white white blonde. Heigl was initially photographed while out in Los Angeles on Thursday. She was also photographed out to dinner with her husband and her new cut was coiffed in an array of loose curls. The big question is why did Katherine go to such a drastic short hairstyle? Is it because of a new film role or is it because she likes the new short hair trend? Or maybe it’s easier to take care of now that she’s busy being a mom. Meanwhile supposedly Heigl and Modern Family cutie Sofia Vergara are supposedly not getting along on the set of New Year’s Eve. According to STAR, insiders say there so much tension between the two start they are completely ignoring each other. (NAPSA)—Whether you’re slicking your hair up or embracing your curls, this season’s trendiest looks start with healthy hair. Itchy, flaky scalps are not confined to the colder months, and not caring for your scalp can cause hair to look less than lustrous. Dandruff in summer can make this a yearlong problem. Scalp sensitivities associated with dandruff can lead to increased scratching and touching of the scalp, which can damage delicate scalp skin and the hair cuticle, leaving hair dull and lifeless. • Having a healthy scalp is especially important going into the warmer seasons like summer. Use a conditioning shampoo with zinc pyrithione, like Head & Shoulders, to get your scalp ready. • Start the season with your hair in its best condition by getting a haircut! Damaged hair with dead ends can leave you with unhealthy-looking hair. • A great mini treatment for the beach is putting conditioner in your hair and leaving it in there. Try Head & Shoulders Smooth & Silky conditioner. Your hair will absolutely feel soft to the touch. 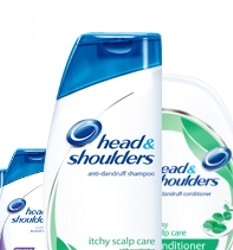 To learn more about great products for a healthy scalp and beautiful hair every season go to: HeadandShoulders.com. Although I had a strong feeling that Ashton Jones was doomed to be sent home in American Idol’s Season 10 first audience based elimination, I was sad to see her hair leave the stage. Making it into the bottom three along with Karen Rodriquez and Haley Reinhart, Jones got the audience influenced boot. While I agreed Jones didn’t do Diana Ross’ “When You Tell Me That You Love Me” justice, I loved her big beautiful bouncy curls. She was a diva-in-training and Jennifer Lopez obviously loved her attitude on stage. Unfortunately gorgeous natural curls, a smokin hot body and a sassy attitude just doesn’t cut it on American Idol. Especially this year with the stellar talent the three AI judges let through the gates to the Top 13. It was a little surprising how many of the top 13 stumbled on Wednesday night. Karen Rodriquez is clearly a favorite of Judge Lopez and Rienhart is known for her unusual range and vocal textures. Both Rodriquez and Rienhart turned in lackluster performances. Rienhart’s rendition of Selena’s “I Could Fall in Love” was especially disappointing.